The application of convex lens to focusing light rays at a single point is explained in this school science animation, also find out how an ice can also be used for burning. Useful for understanding application of lenses. What is meant by focal length? Can a concave lens light a fire? Can a paper be burnt by focussing light from a bulb? How can sun situated so far away burn a paper? 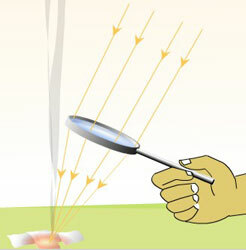 Convex lens can be used to light up fire by concentrating the sun's rays at a point. Since the lens is located very far from the sun, the rays reaching the lens are essentially parallel. A beam of parallel light rays after passing through a convex lens converge at its focus. The object which is to be burnt should be placed at the focus of the convex lens. The lens focuses not only the sunrays but also their radiant energy at a single point which lights up fire. Even ice carved in a shape similar to convex lens can be used to light fire. The ice to be used should highly transparent and it'll behave as if it's a convex lens. If you are still unclear about the concepts, please refer the animation below. what is meant by focal length ? Can a concave lens light a fire ? Why does paper burn ? Can a paper be burnt by focussing light from a bulb ? How can sun situated so far away burn a paper ?